Every human enterprise gives rise to its own brand of networking. One might argue that networking is the lifeblood of success. Some describe it as “playing politics,” some subscribe to the philosophy of “It’s who you know,” and then there are some who are content in the belief that, “good things come to those who wait.” Networking is a powerful and essential tool for any endeavor and we want to show you specifically how the voice actor can use it to ignite career success and create meaningful long-term relationships. In years past, word of mouth was generally enough to keep a relatively small pool of voice actors busy doing the lion’s share of the most lucrative jobs. 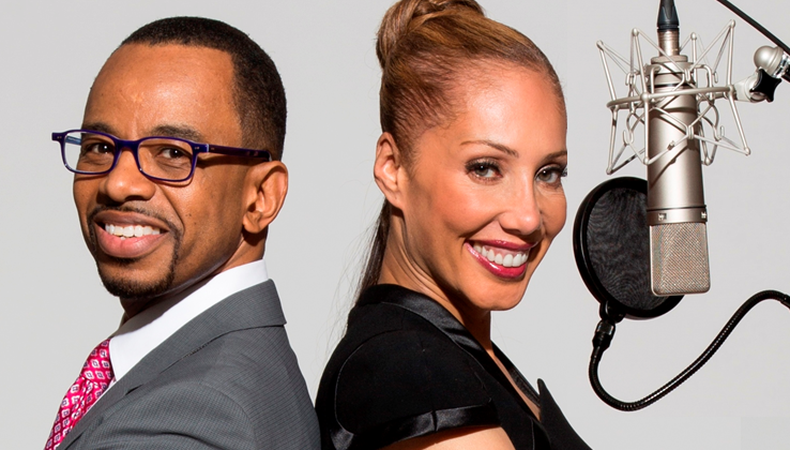 Now the industry is decentralized—spread out across a web of home studios and new digital offerings that have created greater demand for more varied and more specialized voiceover skills. The evolving nature of the industry and supporting technologies is more of a moving target with new specialties emerging daily. Networking is the great equalizer. It is one of the most useful tools you can employ towards a successful career outcome. The key is in learning to appreciate the mindset of the people with whom you wish to network. Gaining this appreciation takes time, experience, and research, but mostly it involves listening to your target audience. 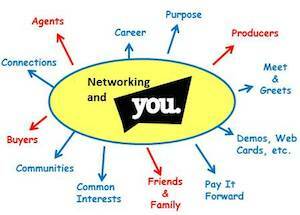 Networking is the creation of a community resource where synergy fuels success for all within the community. To prepare yourself to develop such a community, diagram a picture or chart of the community of people with whom building relationships will do three key things: generate work, friendship, and prosperity for others; generate work, friendships, and prosperity for yourself; and identify the personal skills, contacts, and resources that you can personally bring to bear on the two reasons listed above. Familiarize yourself with the professional roles of buyers, producers, and facilitators. These professionals work inside TV networks, movie studios, production companies, talent agencies, casting agencies, ad agencies, gaming and toy companies, etc. Their titles (EVP, SVP, VP, Executive, Director, Manager, Producer, Copywriter) will relate to the following departments: creative services, marketing, on-air promotions, advertising, sound design, programming, digital/web content and production. Now, let us introduce you to a concept we’ve coined as “the fourth wall of networking.” In acting, the fourth wall is known as the imaginary wall between the actor and the audience. If the actor turns toward the audience, he is facing the fourth wall. If the actor speaks directly to the audience, it’s called “breaking the fourth wall.” In networking we describe the fourth wall as turning to friends and family who live and work outside of the voiceover industry—the connection being that some of your friends and family work inside companies that maintain marketing and advertising departments.Breaking the fourth wall is known to be a somewhat risky proposition because it can be disconcerting for the audience if not done just right. The same is true for breaking the fourth wall of networking. You don’t want to damage the relationships you have with friends and family. Keep in mind that however wonderful a person you believe yourself to be, breaking the fourth wall of networking takes a profound degree of self-awareness and sensitivity to others. If you’re looking to get out there and network, and grow your voiceover career, here are some useful tips. 1. Understand that the meaning of networking is to establish multiple relationships that connect on a variety of meaningful levels, some of which you may serve only a peripheral role. It’s not about meeting one key person, but meeting multiple people and appreciating the relevant connections between you. 2. Be honest and straightforward in your dealings. Don’t play the game of “fake it ’til you make it.” You will eventually be found out and you will not be given a second chance. 3. The goal of good networking is to create a network of people with whom you are able to build and develop opportunities toward mutual interests. 4. Be consistent. Half the battle is being recognized as someone who shows up regularly at key conferences, events, and happenings. It may take showing up at a voiceover conference like That’s Voiceover! year after year before you finally get detected by the radar of someone with whom you can establish a meaningful connection. 5. It’s not enough to bang your drum. You have to play an intriguing beat. 6. Embrace the practice of learning about what other people need as opposed to trying to convince them that they need you. Remember, even that major agent or producer you want to meet has his or her own challenges to manage. Aside from voice acting, you may know someone who can help him or her meet that challenge. Be aware of what you can do for others. 7. Know your specialty and be prepared to describe it in a clear and concise manner. Don’t describe yourself as being good at five different professions. People won’t see you as multi-talented. Instead, they’re more likely to see you as having no “special” expertise. Obviously, voice actors are expected to have multiple talents related to voice acting and it’s fine to discuss those skills if the opportunity presents itself. 8. Don’t turn a first meeting into a “do or die” scenario. A first meeting is like a first date. You explore interests just far enough to see if a second date is warranted. 9. Hold people to their word and no more. If someone says to call, be sure you follow up accordingly, and include a note that you’re following up as requested. On the other hand, if someone says, “Maybe we’ll talk sometime,” don’t follow up under the false pretense that they said they wanted to meet with you. 10. Collecting business cards is more important than handing them out. A business card is tangible information and a solid point of contact. When a serious person gives you their business card, they’re handing you an opportunity to build a relationship. 11. Don’t hand out business cards like popcorn assuming you’ll get a bite by playing the numbers game. The choice to offer your business card tells people about who you are. In the best case scenario, one exchanges cards when a conversation produces a clear benefit to a future connection. The worst case is when you hand out your card as a perfunctory reflex to meeting someone. 12. Once you’ve had a meaningful meeting and exchanged cards, take a moment to yourself to jot down a few key points about the encounter. Did they recommend a book or restaurant, or point out a particular problem they’re trying to solve? Be ready to refer to these things when you speak to them again. 13. Your personal brand is shaped by the consistency of your presentation. Consistency begins with following up on any and all promises. Keep track of your contacts and follow up with a “nice to meet you” card. (Contrary to popular belief, follow-through is a rarity in business. )A personal note of appreciation makes a person feel special. 14. Networking is more than scoring a connection with the people you want to meet. (Remember that there are people who want to meet you, too! )Rather than focusing on hunting down the moguls, make friends with everyone and allow the networking to expand organically. Remember, networking works both ways. You want to be as invested in helping others as you want others to be invested in helping you. 15. Paying it forward is a powerful way to build a rewarding network of long-term relationships.